4.1. In all of their actions, duties and resolutions, the representatives and officers of the Student Senate shall comply with this Constitution. 4.2. Each officer and voting representative may cast one vote on matters considered by the Student Senate. No officer or representative may vote by proxy. 4.3. Meetings of the Student Senate. 4.3.1. The president shall call a meeting of the Student Senate at least once each month from October through May of the academic year. 4.3.2. The Student Senate, by resolution, may establish quorum requirements for meetings. 4.3.3. The president shall preside at all meetings of the Student Senate, or in his absence, the person next in line of succession to the president shall preside. 4.3.4. 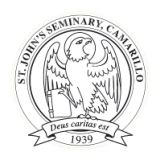 Any enrolled student at St. John’s Seminary may attend meetings of the Student Senate unless that student has been barred from Student Senate meetings by a two-thirds vote of the representatives and officers of the Student Senate. Persons other than students may attend meetings of the Student Senate only if authorized by resolution of the Student Senate. 4.3.5. The identity of any student taking a position or expressing an opinion in any meeting of the Student Senate will be held confidential in all reports and records, oral or written, unless the student waives this confidentiality in writing. 4.3.6. The Student Senate shall, by resolution, adopt procedures for its meetings. 4.4. Resolutions of the Student Senate. 4.4.1. A proposal sponsored by two or more representatives and officers of the Student Senate shall be considered by the Student Senate within the next two regularly scheduled meetings (Non-voting representatives not to be excluded from sponsorship of proposals). 4.4.2. The Student Senate may consider other proposals according to procedures established by resolution of the Student Senate. 4.4.3. Before a proposal is voted upon by the Student Senate, each officer and representative shall have a reasonable opportunity to address the Student Senate regarding the proposal. 4.4.4. A proposal is approved as a resolution of the Student Senate by a simple majority of votes cast by officers and representatives of the Student Senate. 4.5. The president, in his discretion, may serve as a member of any committee of the Student Senate. 4.6. Records of the Student Senate. 4.6.1. Except for the financial records held by the treasurer, the secretary shall be the custodian of records of the Student Senate, including (but not limited to) this Constitution, resolutions of the Student Senate and minutes of meetings of the Student Senate. 4.6.2. The treasurer shall be the custodian of the financial records of the Student Senate. The treasurer shall maintain the financial records of the Student Senate and provide financial statements to the Student Senate at least once every academic semester. 4.7. The treasurer shall maintain the bank accounts and investment accounts of the Student Senate. The treasurer shall receive and disburse money and other assets of the Student Senate as authorized by resolution of the Student Senate. 4.8. The vice president shall also serve as coordinator of community activities in addition to responsibilities already given. In his role as principal coordinator of community activities, the vice president shall bring activities and expenditure requests before the Student Senate as well as provide oversight of budgeted community activity fund(s) of the Student Senate. This role as community activities coordinator will be implemented as a pilot program for the 2005-2006 academic year with the remaining membership of the activities committee filled by volunteers from the seminary community at-large.